Discussions with some PIE LTER scientists about the invasive marsh plant, Phragmites australis (Common Reed). Salt Marsh Science, PIE LTER's schoolyard project, is enhanced by additional schoolyard activities led by Mass Audubon staff including the Perrenial Pepperweed Control Project and Seeking Relief from Sea Level Rise Student Mapping and Leadership Initiative. To learn about all these inspiring initiatives, click here for video. 21st Annual Coastal Science Conference, organized by Mass Audubon's Salt Marsh Science Project. Research and Resiliency: Investigating the Local Effects of Global Changes. How are human activities impacting our planet’s climate, water cycle, and the balance and distribution of species and ecosystems? How are PIE-LTER scientists investigating these questions in Massachusetts, and what steps are citizens taking to help have a more positive impact? Middle School and High School teachers will have the opportunity to investigate these questions this summer as part of a course. During July 2016, teachers from Massachusetts middle and high schools participated in the 2016 Summer Professional Development Institute, Research and Resiliency: Exploring the Ways Local Ecosystems are Responding to Global Change. This summer institute, held at Ipswich High School, was a collaborative effort of Mass Audubon’s Endicott Wildlife Sanctuary, Plum Island Ecosystems Long Term Ecological Research (LTER), the US Fish and Wildlife Service, Ipswich River Watershed Association and Boston University. Data Nuggets - are classroom activities, co-designed by graduate students and teachers, which give students practice interpreting quantitative information and making claims based on evidence. PIE LTER contributes to Data Nuggets, check them out for ideas for classroom activities in the Plum Island area, PIE Data Nuggets. Landcover data for 26 towns associated with Clark University holmes project (HERO object-based Lawn Mapping Exploration of Suburbia), a subgroup of the HERO project which conducts .45 meter resolution mapping of the Plum Island Ecosystems Long Term Ecological Research Site. Danger in the Reeds: The Great Marsh Classroom with Liz Duff and Lori LaFrance. Follow students participating in the PIE-LTER schoolyard “Salt Marsh Science Project” with Mass Audubon Education Coordinator, Liz Duff. Ipswich High School Students learn about tidal restrictions, which alter the flow of salt and fresh water and have a major effect on the conditions which can favor the growth of the invasive reed Phragmites. 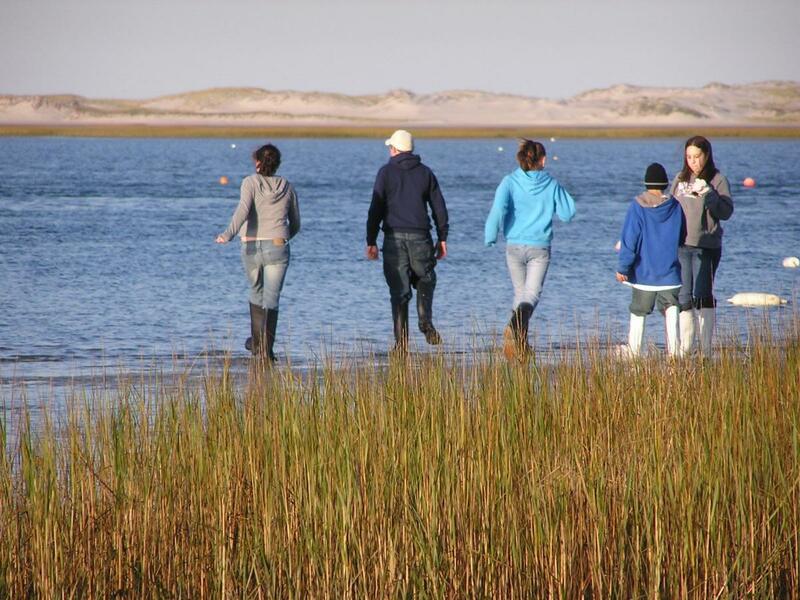 Students present their findings at Mass Audubon’s 17th annual Coastal Science Conference. Filmed by Rick Hydren of Staddles Productions. MBL senior scientist Anne Giblin was recently named a Fellow of the American Association for the Advancement of Science (AAAS), the world’s largest general scientific society and publisher of the journal Science. The Ecosystems Center was recently awarded a National Science Foundation (NSF) Field Station and Marine Laboratory renovation grant to improve our Marshview Field Station which is the field site of the (PIE-LTER) project. Samantha Bond and Samuel Kelsey collaborate with Encyclopedia of Life (EOL) to create a field guide for organisms associated with PIE LTER research. Anne Giblin, postdoctoral scientist Inke Forbrich and other PIE LTER research staff have built a 40-foot instrumentation tower at the Plum Island Long Term Ecological Research site in northern Massachusetts to allow them to make year-round measurements of net ecosystem carbon exchange. A long-term, large-scale study of salt marsh landscapes in an undeveloped coastline section of the Plum Island Estuary in Massachusetts has shown that nutrients such as nitrogen and phosphorus can cause salt-marsh loss.